On Thursday afternoon the servant of a gentleman of Ham Common was stopped by three footpads, on Teddington Common, who robbed him of what money he had, and beat him very much. Yesterday his Majesty, with his attendants, rode out on horseback in Richmond Park, followed by the QUEEN and PRINCESSES, in two coaches and four. 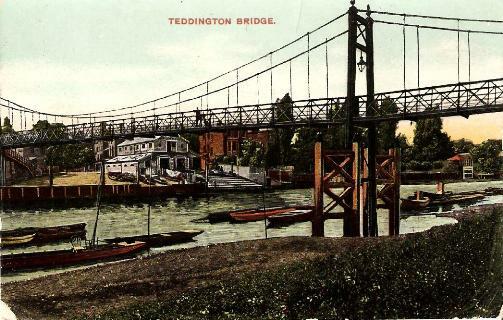 In the evening their MAJESTIES took an excursion to Teddington, where they paid a visit to ROBERT ADNEY, Esq. and after staying some time, being highly delighted with the beautiful pictures, returned to Kew Palace. - The King comes to town today. 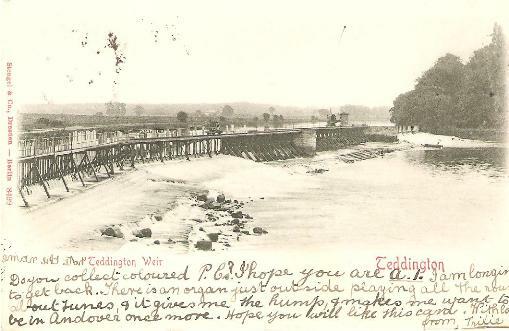 On Monday there was a meeting of the inhabitants of Teddington, when above 30 turned out as Volunteers of Infantry and Cavalry, in case their services should be wanted. His Royal Highness the Duke of CLARENCE attended the Meeting, and after informing those who had enrolled of the duty required of them, entered his name in the ranks, and told them, he would not only go with them wherever they were ordered, but would stay by them till they returned to their homes. Nov.26 John Lockyer, John Lockyer Wainwright, and Elizabeth Wainwright, were brought up to plead to the matter contained in an information filed ex officio, by the Attorney General, charging them with a conspiracy to entice and carry away one Mary Pearce, an illegitimate daughter of Thomas Pearce, Esq. from Teddington, in the county of Middlesex, she being there and then possessed of land and property to the amount of 15,000l, and upwards, and living under the care and protection of John Crutchdale and John Emmett, her guardians; and also with enticing and persuading the said Mary Pearce, she being an infant of 16, to leave the house of the said John Crutchdale, and secretly and clandestinely setting off to Gretna Green, where the said John Lockyer caused and procured a solemnization of marriage with the said infant Mary Pearce, and again at the parish church of St. Luke's, Old-street, with intent to obtain possession of the property of the said Mary Pearce, he being a man of low condition, advanced in years, and when knowing her to be so entitledand possessed of property. The parties pleaded "Not guilty," and withdrew in custody of the warden of the Fleet Prison. John Lockyer, appeared to be the father of John Lockyer Wainwright, and is upwards of 50 years of age: the son's wife we understand to be the aunt of the young girl; but by this unaccountable compact, the niece becomes mother in law to her aunt, and the father the parent of a son and daughter twice as old as his wife. In Teddington were buried Sir Orlando Bridgman, Lord Keeper, and Thomas Traherne, its curate, author of "Christian Ethics," 1674; Margaret Woffington, actress, 1760; Dr. Stephen Hales, its curate for fifty-one years, philosopher, 1761; Henry Flitcroft, architect, 1769; Paul Whitehead, poet, 1775; and Richard Bentley, poet and dramatist, son of the critic, 1782. Here resided Sackville, Earl of Dorset, Lord Treasurer; Dudley, Earl of Leicester, Elizabeth's favourite; William Penn, the Quaker; and Francis Manning, poet and dramatist.